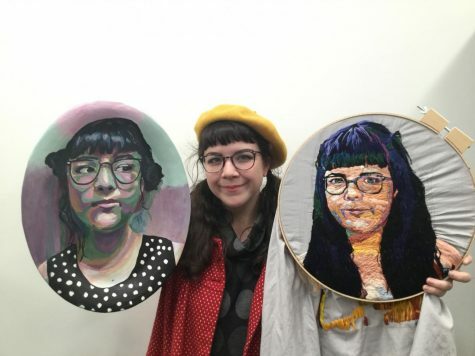 Rusgrove poses with her two self-portraits, one made from embroidery and the other with paint. Allison Rusgrove is in her final year of her B.S. of Art Education at Central Connecticut. While most artists will tell you that they have pursued art since they were young, Rusgrove’s artistic career began much later in her life. During her senior year of high school, Rusgrove did not think she would attend college and did not put much thought into what subject she would study if she did attend college. At her high school, all students were required to take an art elective. Rusgrove chose painting, not knowing it would change her life forever. She soon found herself loving art. This teacher went on to enter Rusgrove in art competitions, such as the Scholastic Arts Program, for which she won gold and a scholarship to an arts college. 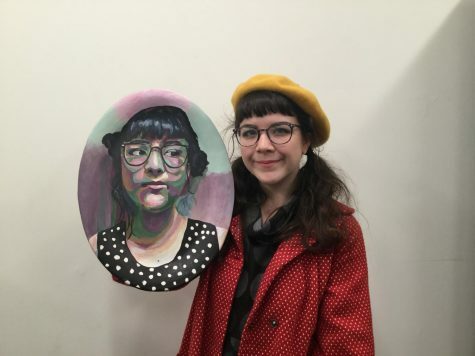 However, this arts college did not offer degrees in art education, which was what Rusgrove realized she wanted to pursue after being inspired by her teacher. Rusgrove hopes to teach art to elementary students once she gets her certification. She admitted that the path to becoming certified can be strenuous at times, but she reminds herself that it will all be worth the hard work in the end. She also said she relieves her stress by working on art outside of her classes. Another medium of art that Rusgrove enjoys working with is embroidery. 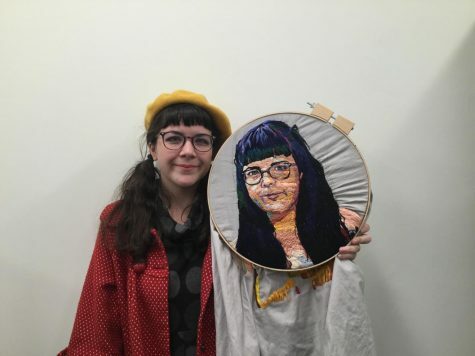 The upcoming Art Educators 2019 exhibit will feature her embroidered self-portrait. She described embroidery as “needle painting.” She takes a needle and paints with it as if it were a paintbrush. Rusgrove also described the logic behind her affinity for creating self-portraits. Next semester, Rusgrove will be student teaching for eight weeks in an elementary school, and eight weeks in a secondary school. 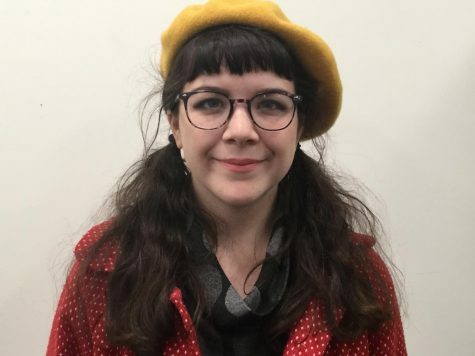 She feels slightly nervous, but she also knows that she has been well prepared by the art education program and that CCSU has given her the practice and skills she needs in order to be successful.